When Tawny was six months old my goats began kidding and I introduced her to her first newborn kid. Her reaction was perfect! She fell to the ground immediately in response to the nervous mother's first aggressive move. She then crawled with slow eagerness toward the newborn. When the nervous mother positioned her head in an even more aggressive posture, she rolled on her side, maintaining the lowest possible profile. When she was almost at the kid, the agitated mother began butting her. Tawny remained passive under this assault until the mother backed off. She then slowly continued crawling toward the newborn. When Tawny reached the weak, wet newborn, she carefully, gently, licked the kid with maternal affection. As the mother calmed down, Tawny stood immobile above the newborn, trembling with eagerness and exaggerated caution as the newborn nuzzled her in an attempt to nurse. When I saw Tawny do all of these things, and more, I knew I had found a valuable working Anatolian. 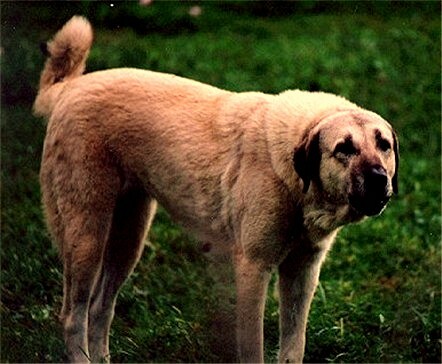 In 1997 I bred Tawny to an outstanding 140 pound nationally rated show male (from working parents) owned and handled by Elyse Griffin of Houston. 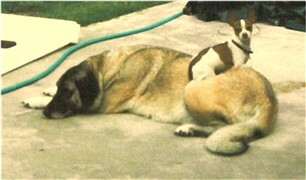 Tawny had difficulty having the pups and through a sequence of vet errors, Tawny died. Of the ten pups she carried, five pups were saved. However, because they did not receive any colostrum, only three lived past three days. They survived because I began feeding them fresh goat's milk. This unexpected loss of my beloved Tawny is the most emotionally devastating event of my life. As much as I loved her, I felt that she loved me even more! When these three remaining pups were nine weeks old another vet error (a different vet) resulted in all three pups coming down with parvo. The vet incorrectly administered live, low passage parvo vaccine even though he knew that these pups had not received maternal antibodies through their dam's colostrum. 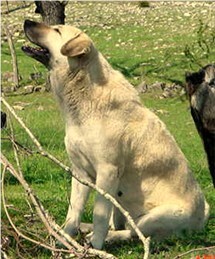 Of the three remaining pups, only two females were saved, Shadow and Autumn. Of course, I kept these pups. Both are large, show quality females who have demonstrated superior working ability. Both Shadow and Autumn have been checked for dysplasia and, like their mother, have OFA "good" hips and elbows. 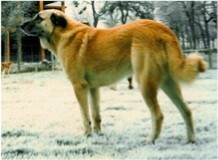 Tawny had the most perfect working ability of any Anatolian I've known. When moved from her home pasture to a pasture with weak fences surrounded by coyotes and a large herd of known calf-eating, wild pigs, she protected her charges without losing a single animal. Tawny was raised using my STRICTLY WORKING METHOD. Tawny was closely bonded to her goats, completely loyal to me, and had no use for any other human. Even so, when I took her to the vet she remained aloof but polite to others present. 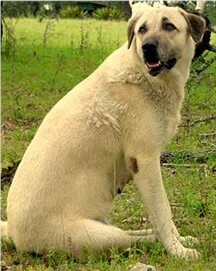 Tawny was an exceptionally "tuff" Anatolian with amazing guardian ability. She loved her sheep and goats and was slow and gentle with her kids and lambs. She was fearless, aggressive, and unrelenting with predators. She had great independent decision making ability and seemed to always know the "right" thing to do.